Living... anywhere that will have him. Cassidy is something of a nomad, which is a fitting life for a 119-year-old Irish vampire. Visiting... Annville, Texas. Cassidy crash-lands there after jumping out of a failing airplane. 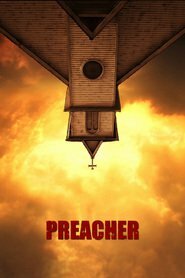 He quickly befriends a local preacher named Jesse Custer and decides he might as well stick around for a while. Profession... vampire and handy man. Once he decides to remain in Annville, Cassidy offers to do odd jobs at Jesse’s church. He’s not quite as skilled at fixing air conditioners as he thinks he is, but he pitches in where he can—especially when Jesse finds himself in need of backup during a brutal fight. Relationship Status... single. Cassidy seems to be more than happy enjoying a single life with frequent trips to the local brothel. But he can’t help but fall for a no-nonsense, gun-totting woman named Tulip O’Hare. Challenge... fighting off the religious fanatics who want him dead. No matter where he goes, Cassidy can’t seem to shake off the vampire-hating zealots who are out to kill him. Thankfully, he’s got the fighting skills to fend them off. And it also helps that as long as he has access to blood, he’s virtually immortal. So long as he stays out of the sun, of course. Cassidy's popularity ranking on CharacTour is #1478 out of 5,000+ characters. See our top-ranked characters and read their profiles.